What's it like taking Alexa everywhere? I'm a big fan of Alexa on Amazon's Echo devices. She's proved abundantly useful in my daily life, from quickly giving me a morning briefing to providing recipes when I'm cooking and timers to quickly turn my lights on and off. Gradually, Alexa has been growing beyond Amazon's hardware to other devices, lamps, watches… even fridges. The company wants Alexa to be your window into the world of Amazon at every turn. It has also been trying to expand Alexa beyond voice, such as with the Echo Show, which I've been using recently. The thing about Alexa though is that she's still perfectly suited to living at home. So what happens when you take her outside? Can Alexa help out with the rest of your day? That's what I aimed to find out while using Martian's mVoice Watch, which has Alexa integration built right into it – all you have to do is hold a button. Is there life for Alexa outside of these four walls? 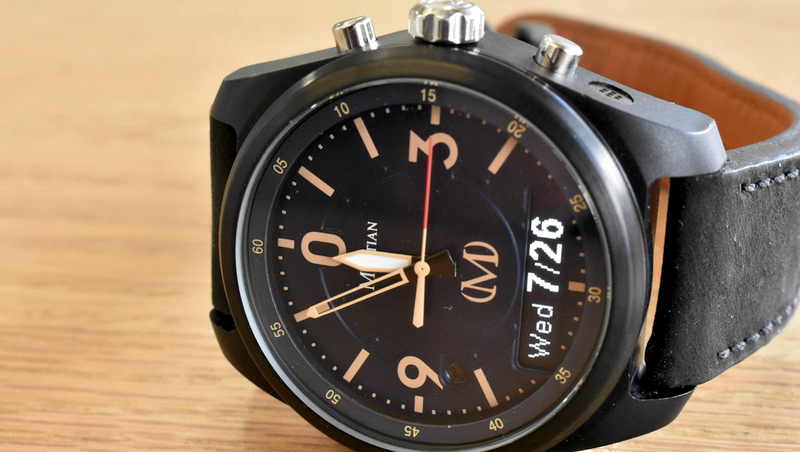 Like any other connected watch, the Martian mVoice uses Bluetooth to connect to your phone. Once you've done that, all your notifications filter onto the tiny LED screen near the bottom of the watch face. This area also functions as the menu for the watch, letting you scroll through options and other such things. It's also where you get to see how you interact with Alexa. There are three buttons on the watch. The top button is used to connect to Alexa or your digital assistant (one tap for your phone's assistant, a long press for Alexa). Now, Alexa isn't directly on the Martian. Instead, the Martian functions as a Bluetooth-based middleman between you and her. It has a microphone and speaker, and is routing your query to your phone, and then routing Alexa's response to the watch. My feelings on the design here are… mixed. From far away, it looks like a classy watch; get a bit closer and it's less so. Most of that is down to the ugly side flap protecting the microUSB charging port and the watch face design, which looks like it's been inspired by the front of an old steam engine, in that it has fake train rivets in a ring, with the bottom ring being interrupted by a rectangular LED screen and a singular LED notification light. In sum, it's too busy. As for Alexa, it turns out that taking Alexa out of her home-based element blunts her effectiveness quite a bit. Instead of simply calling out "Alexa" you have to hold down a fairly uncomfortable button and wait for the watch to tell you she's listening. Then you speak, then you wait, then she responds. The magic-like feeling of calling out and then getting a near-instant response, as you would on an Echo device, just isn't here. Alexa's abilities are still the same. She can still tell you stories and set your timers, turn your lights on and off, check the weather and give you your daily briefing. It all feels different though. Outside of the home, Alexa feels a little less easy to use. It's not as comfortable asking Alexa for the weather in an office full of people, or checking the next Caltrain departure walking through a city. I could tell her to turn on my lights on the way home, but it isn't as easy or as publicly comfortable as doing it on my phone, which takes about the same amount of time. On top of all that, because it's using a watch microphone to get your responses, she also doesn't understand you as easily. You have to kind of move your head near your watch, which is far more limiting than the shouting-into-the-ether feeling of an Echo. Basically, all the drawbacks of using a voice-based AI on your wrist still apply when it's Alexa, something she usually doesn't have to contend with. On top that, it highlights how, for now, Alexa is really made for the home. She doesn't have the same autonomy over my phone that Siri or Google Assistant do. Asking her to read my text messages, for example, just gets a response that Amazon messaging isn't supported on my device. Thanks, Alexa. So does the Martian mVoice do better at home? Only if you don't already have an Echo device. Because you have to press and hold a button to activate Alexa on the Martian, it takes more time to use the watch than to call out to an Echo device. Alexa on the Martian isn't as seamless in the home compared to an Echo, and it isn't as useful as its competitors on watches. As previously mentioned, the Martian mVoice routes all your Alexa integrations through Bluetooth. It's got speakers on the side, so while Alexa is thinking on your phone, her voice comes through on your watch. This seems like a savvy way to work around not putting Alexa directly on your watch, which would require Wi-Fi or LTE to connect to the internet. Instead, it's a frustrating experience that will drive you crazy. Because the watch is connected to your phone, all of your phone's sounds will route to your watch. So if you're trying to watch a YouTube video or a clip on Twitter or Facebook, they'll get routed to the watch. You'll then have to go to your phone and switch your sound to your phone speakers. This is worse if you're using a pair of Bluetooth earphones, like AirPods. You'll put on your earphones and make sure they're connected, ready to listen to music. You'll pick that one special jam, and it'll start playing on your watch. Frustrating. Also, slightly embarrassing. Especially if you're on a train when it happens and you don't realise it's happening until it's too late (which may have happened to me on more than one occasion). Battery life is another annoyance. Martian says you'll get about five days out of it. I got about two. I believe most of the battery life struggles come from connectivity issues, because of how many times you have to connect and disconnect from the watch's speaker to route the sound where you want. On top of that, if you walk about 10 feet away from your phone, you'll get a notification that you're out of range and it'll disconnect. When you walk closer, it reconnects. All this connecting and disconnecting and reconnecting drains the battery life, and when you have a whole bunch of notifications and Alexa use on top of that, you get two days. Trying to integrate the Martian mVoice into your daily life causes you to constantly adjust your daily life to slot in its abilities. And that's just the Bluetooth. The hardware itself is fine, but it opts for a microUSB port instead of a magnetic charging puck. Sure, whatever, right? Except that the flap that protects the port tends to get stuck if you push it in just a little too much. You'll need to get a nail or something equivalent to get it unstuck. The Martian mVoice has proved to be one of the more frustrating wearable experiences I've ever had. If Alexa proved to be perfectly suited for life on a watch, it's still something I wouldn't recommend to people. It disrupts your other devices in all the wrong ways. Alexa on the wrist just isn't as useful as Alexa in a speaker at home, at least for now, and it's totally inferior to its competitors on the wrist outside of the home. At $295, those deficiencies and annoyances are not worth it in any way, shape or form.